The crust is compositionally distinct outermost rocky layer of the Earth. What is the crust made of? The answer to this question depends on whether we want to know which chemical elements, minerals or rock types it is made of. It may be surprising but about a dozen chemical elements, minerals, or rock types is all that it takes to describe approximately 99% of the crust. This article is about these really common and maybe some a little less common but noteworthy building blocks of the ground beneath our feet. Common rocks in the crust. Igneous rocks in the first row: granite, gabbro, basalt. Metamorphic rocks in the second row: gneiss, schist, amphibolite. Sedimentary rocks in the third row: sandstone, shale, limestone. The most common chemical elements in the crust are oxygen (46.6%), silicon (27.7), aluminum (8.1), iron (5.0), calcium (3.6), potassium (2.8), sodium (2.6), and magnesium (2.1). These figures vary among different studies because we really have no way to know for sure. This is an estimation of the chemical composition of the crust based on our understanding of the relative proportions of different rock types in the crust and their average composition. Our understanding is limited for sure because the average continental crust is more than 40 km thick but we have no way to sample it directly. Deepest mines reach only 4 kilometers and deepest drillhole is 12 km deep. Oxygen 46.6 Silicates, oxides, etc. Oxygen is extremely widespread in the crust and very reactive as well. Volumetrically insignificant part of all the minerals contain no oxygen. Almost every common rock type contains oxygen. Only sulfide ore bodies and evaporite beds are almost free of oxygen, but they are volumetrically relatively insignificant. Silicon 27.7 Silicon has its very own large group of minerals known as silicates. More than 90% of the crust is composed of silicate minerals. Silicon and oxygen are the two most common chemical elements in the crust that also happen to like each others company very much. Pure silicon oxide is known as mineral quartz which makes up 12% of the crust. There is not a single common non-silicate mineral that contains silicon — silicon always combines with oxygen. Silicate minerals are the building blocks of most common rock types (basalt, granite, schist, gneiss, sandstone, etc.). Carbonate rocks (limestone, dolomite rock) and evaporites (gypsum rock, rock salt) are notable exceptions. They do not contain silicon if they are pure. Opaque ore minerals (oxides and sulfides) are frequent minor components of most rock types. They are also free of silicon. Aluminum 8.1 Very widespread in silicate minerals (feldspar, clay minerals, mica). Aluminum hydroxides (boehmite, diaspore, gibbsite) are economically important as aluminum ore minerals. 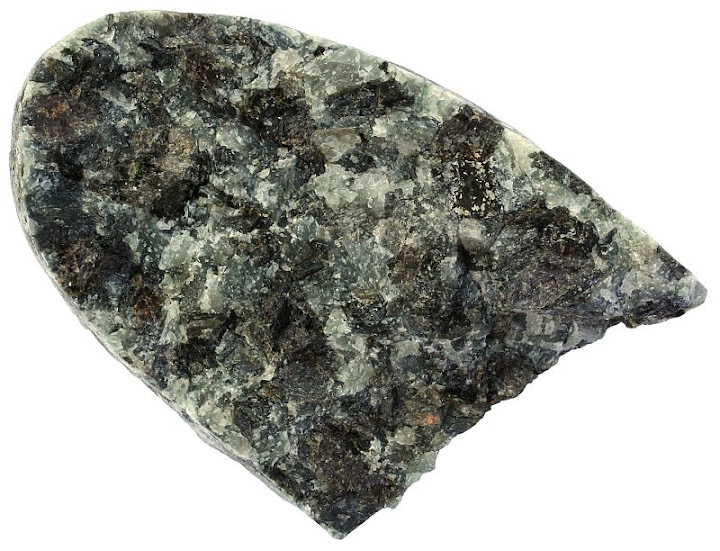 Feldspars are very common minerals in the crust, more than half (51%) of the crust is made up of this mineral group. Mica and clay minerals are also common, both comprise about 5% of the crust. Hence, aluminum is extremely widespread as well. It is usually not very concentrated in silicate minerals, though. Aluminum has been extracted from silicate rocks very rarely. Bauxite which is aluminum-rich laterite formed in humid hot areas contains aluminum hydroxides and is primarily mined for aluminum. Aluminum in bauxite is a residue of chemical weathering of silicate rocks. Iron 5.0 Iron is a widespread element in minerals. Notable iron-rich silicate minerals are pyroxenes, amphiboles, olivine, black mica biotite, garnet, etc. Iron is also an important element in sedimentary rocks. It is just like aluminum hard to dissolve and carry away with water. Iron is common in lateritic soil and forms rust-colored iron oxide mineral hematite. Hematite is responsible for the red coloration of many minerals and rock types. Iron oxide magnetite is common as an accessory mineral in metamorphic and igneous rocks. Iron sulfide pyrite is the most common sulfide mineral. Iron also occurs in carbonates (siderite, ankerite), clay minerals (glauconite, chlorite). Iron is a strong chromophore element, it gives dark coloration to its host minerals. This is why most pyroxenes and amphiboles are black. Iron is actually the single most abundant chemical element in the whole of Earth, but most of it is in the core. Basalt, gabbro, amphibolite, greenschist, etc. are the most notable crustal rocks that contain lots of iron. There is a large number of rock types that contain significant amount of iron, but most of the iron mined comes from metamorphosed sedimentary rocks known as BIF (banded iron formation). Calcium 3.6 Calcium is also very widespread. It is always present in plagioclase feldspars (39% of the crust), but the amount of calcium varies there. The most important pyroxenes and amphiboles (augite and hornblende) contain calcium. Calcium occurs in many other silicate minerals like garnet, epidote, wollastonite, titanite, etc. Calcium is a constituent of calcite which is very important mineral chiefly in sedimentary environments. Calcium phosphate apatite is a common mineral as well. Gypsum is a major evaporite mineral that is chemically hydrated calcium sulfate. Calcium fluoride is known as mineral fluorite. Occurs equally successfully in igneous, sedimentary, and metamorphic rocks. Especially well-known calcium-bearing rock type is limestone. Its metamorphosed equivalent is marble. Marble is composed of calcite just like limestone. Calcite is a remarkable mineral. Even igneous rock composed of pure calcite exists. It is known as carbonatite, but it is very rare when compared with limestone and marble. Calcium tends to be part of minerals like plagioclase, pyroxenes and amphiboles in igneous rocks. Major calcium-bearing metamorphic rock is amphibolite (metamorphosed basalt, calcium is hosted by hornblende and plagioclase). Phosphorite is another important calcium-bearing sedimentary rock (calcium is hosted by phosphate mineral apatite). Calcium also occurs in evaporites as a mineral gypsum. Sodium 2.8 Sodium is widespread in silicate minerals. It is an important constituent of both alkali feldspar and plagioclase. Sodium-bearing pyroxenes are relatively rare. Sodium is somewhat more widespread in amphiboles but not as much as calcium. Well-known sodium-bearing silicate mineral is tourmaline. Sodium is an important component of feldspathoids, but both feldspathoids and tourmaline group minerals are relatively rare. Major sodium-bearing mineral in sedimentary environments is halite (NaCl). Igneous and metamorphic rocks that contain feldspar. Much of sodium from weathered igneous and metamorphic rocks is dissolved in seawater. Rock salt is the most important sodium-bearing sedimentary rock. Potassium 2.6 Potassium and sodium are similar chemical elements both chemically and geologically. Potassium is an important constituent of alkali feldspars. Most alkali feldspars contain much more potassium than sodium and are therefore frequently referred to as K-feldspars. Important potassium-bearing silicate minerals are micas (5% of the crust). Biotite and muscovite are the most important micas and they both contain potassium. Most important potassium-bearing sedimentary mineral is sylvite (KCl). Alkali feldspars and micas are common rocks in silicate igneous and metamorphic rocks (granite, gneiss, schist, etc.). Much of potassium from weathered igneous and metamorphic rocks is dissolved in seawater. Sylvite is not as common evaporite as halite (rock salt) because it takes much higher evaporation rate to precipitate sylvite. Magnesium 2.1 Magnesium is very widespread in the mantle beneath the crust. Olivine and pyroxene are the most important Mg-bearing minerals there and these minerals are also constituents of some crustal rocks, especially dark-colored igneous rocks. Amphiboles also contain magnesium but less than pyroxenes. Magnesium ion is similar to iron in size and can therefore easily replace iron in the lattice of minerals. This is the case in olivine, pyroxenes, amphiboles and even micas (phlogopite is a Mg-rich variety of biotite). Important Mg-rich minerals in metamorphic rocks are talc and serpentine. Magnesium in the sedimentary environment occurs chiefly in carbonates dolomite and magnesite. Lots of magnesium is dissolved in seawater. Magnesium is extracted from seawater. Important Mg-bearing igneous rocks are ultramafic rocks (peridotite, pyroxenite). Rocks that contain lots of pyroxenes like basalt and gabbro contain Mg also but to a lesser extent. Metamorphic Mg-rich rocks are serpentinite and talc schist. Most important Mg-bearing sedimentary rock is dolomite rock which is former limestone converted to dolomite by Mg-rich meteoric water percolating limestone. Others 1.5 Other common elements in the crust are titanium, hydrogen, phosphorous, manganese, fluorine, etc. Their occurrence is somewhat more restricted, but they are all important elements in minerals and rocks. Hydrogen is actually extremely widespread constituent of a wide array of minerals, but it is the lightest chemical element and therefore does not form a significant part of the crust by mass. More than 90% on the crust is composed of silicate minerals. Most abundant silicates are feldspars (plagioclase (39%) and alkali feldspar (12%)). Other common silicate minerals are quartz (12%) pyroxenes (11%), amphiboles (5%), micas (5%), and clay minerals (5%). The rest of the silicate family comprises 3% of the crust. Only 8% of the crust is composed of non-silicates — carbonates, oxides, sulfides, etc. If these minerals are really that common, we should all be more than familiar with them. Yes, I believe we are. Even if we don’t know how to name them, we have surely seen them. For the most people the silicates mentioned above are so drab and commonplace that we probably fail to notice or pay any attention to them. Below is a selection of photos showing these minerals in their natural environments (outcrops and hand samples). I am intentionally showing minerals within rocks because this is how they occur in the crust. Beautiful samples with perfect crystal faces may be nice to look at, but they are rare in the crust. I do not value such crystals as a teaching material. You are extremely unlikely to find them on your own and therefore they teach us very little. Plagioclase is the most important mineral in the crust. It is common in mafic igneous rock like the diabase sample above. White elongated phenocrysts in finer basaltic groundmass are plagioclase crystals. Black crystals belong to pyroxene (mineral augite). Both augite and plagioclase occur also in the fine-grained groundmass. Large crystals formed slowly before the magma erupted and the rest solidified rapidly. Plagioclase is so common because basaltic rocks and their metamorphic equivalents are very widespread. Most of the oceanic crust is composed of basaltic rocks. The sample is from Tenerife, Canary Islands. Width of sample 14 cm. Another sample of basaltic rock but this time with lots of olivine. 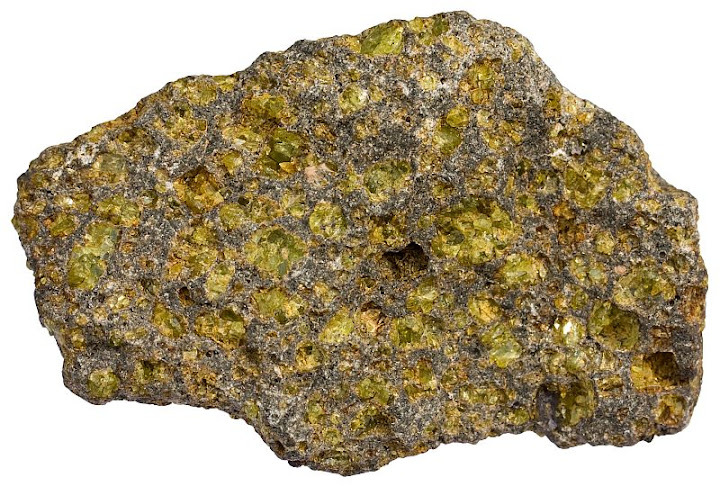 Olivine (green) is denser than plagioclase and pyroxene (both are present in the groundmass) and therefore sinks to the bottom of lava flows where olivine cumulate rocks form. This olivine basalt sample is from Oahu, Hawaii. Width of sample 6 cm. Clay minerals are too small to be shown individually. Even with a light microscope you will see only mud or dust depending on whether these minerals are wet or dry. Clay minerals are silicates that are the products of weathering of other silicate minerals, mostly feldspars. The picture was taken in a clay quarry in Estonia. Biotite is one of two major mica minerals. The other is light-colored muscovite. The sample is from Evje, Norway. Width of sample 11 cm. Rocks are divided into three broad groups: igneous, metamorphic, and sedimentary rocks. The oceanic crust is largely composed of basaltic igneous rocks which are covered by a thin veneer of sediments which are thickest near the margins of the continental landmasses. The continental crust is much thicker and older. The continental crust is also much more variable and structurally very complex. Virtually all the rock types known to man occur in the continental crust. Even meteorites, xenoliths from the mantle, and ophiolites (fragment of former oceanic crust) are constituents of the continental crust because that’s where we found them. Roughly three fourths of the continental crust is covered by sedimentary rocks and almost all of it is covered by loose sediments (soil, sand, dirt, etc.). We are most likely to encounter these materials, but it is important to understand that despite being so ubiquitous on the surface, they make up only about 8% of the whole mass of the crust. Sediments consolidate to sedimentary rocks after burial. Sand turns to sandstone, limy mud to limestone, clay to claystone. Sedimentary rocks are stable only in the upper parts of the crust. High pressure and temperature in the deeper parts metamorphoses them (minerals recrystallize) to various metamorphic rocks. The bulk of the continental crust is made of metamorphic rocks. Igneous rocks are also common on the surface in volcanically active regions, but they also occur deeper in the crust as granitic (mostly) intrusions. 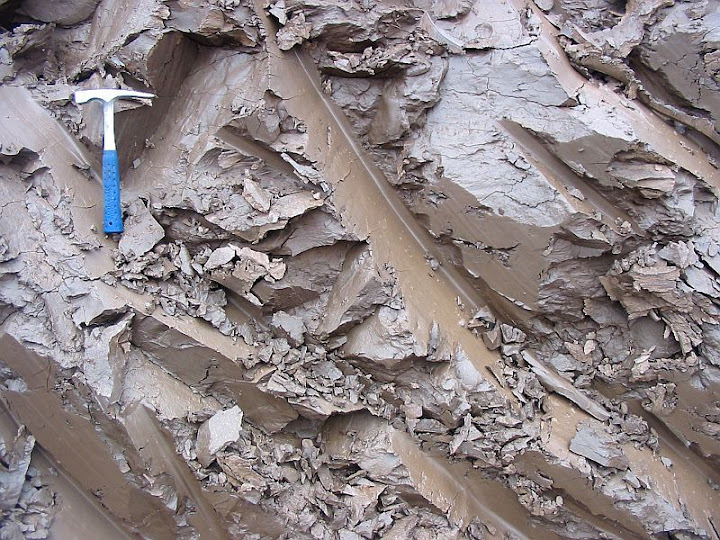 Important sediments are sand, clay, mud (wet mixture of clay and fine sand), and limy mud. Widespread sedimentary rocks are limestone (2% of the crust by volume), sandstone (1.7%), claystone (4.2%) which are lithified versions of the loose sediments mentioned before. Chemical sediments like halite and gypsum are important as well, but their overall volume is clearly less than 1% of the crust. Important igneous rocks are granite, granodiorite, gabbro, basalt, diorite, andesite, etc. It is very difficult to say what is the percentage of these rocks. Important metamorphic rocks are metamorphosed equivalents of widespread sedimentary and igneous rocks. 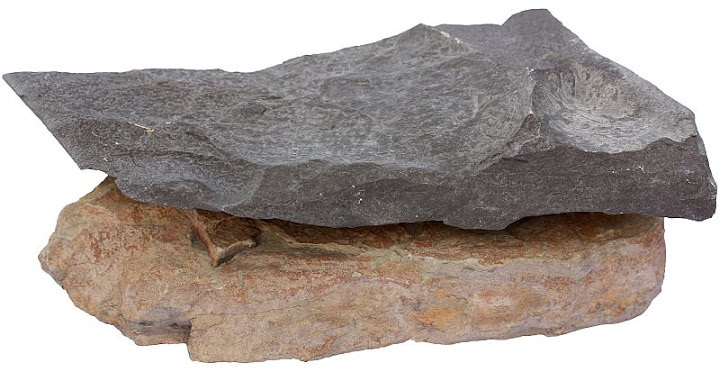 Common metamorphic rocks are slate (metamorphosed claystone), schist (met. claystone, higher grade than slate) quartzite (met. sandstone), marble (met. limestone), gneiss (met. 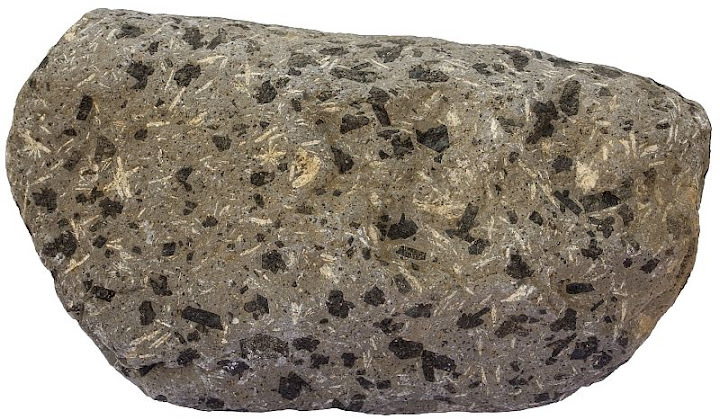 igneous rock or sedimentary rocks), amphibolite (met. basaltic rocks). Majority of carbonate rocks were once carbonate mud on the seafloor. This mud is made of tiny carbonate shells of foraminifera, coccolithophores, gastropods, etc. 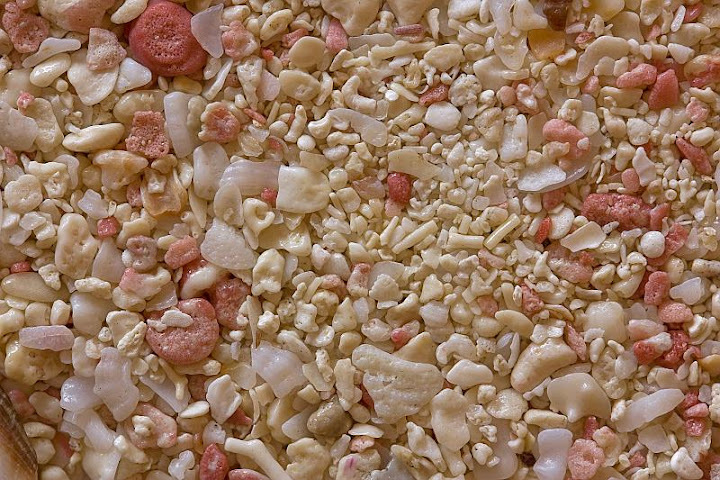 This sample is a coral sand from Bermuda which is composed of bits and pieces of coral reefs and foram tests. Width of view 32 mm. 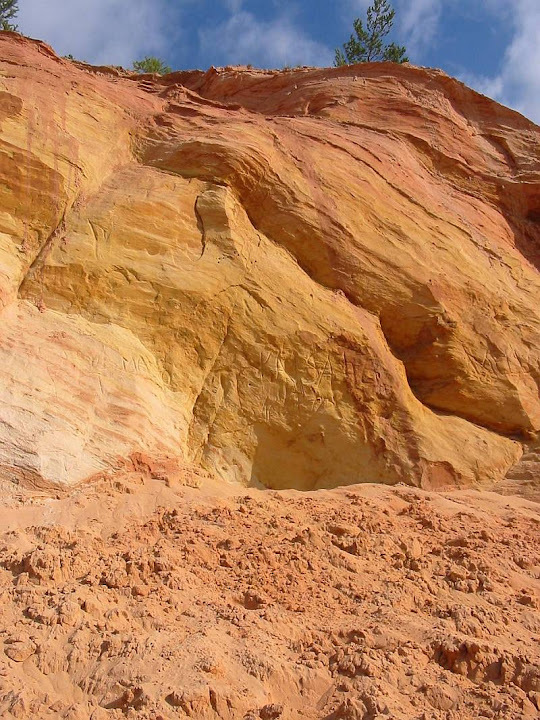 Sandstone is a lithified sand. 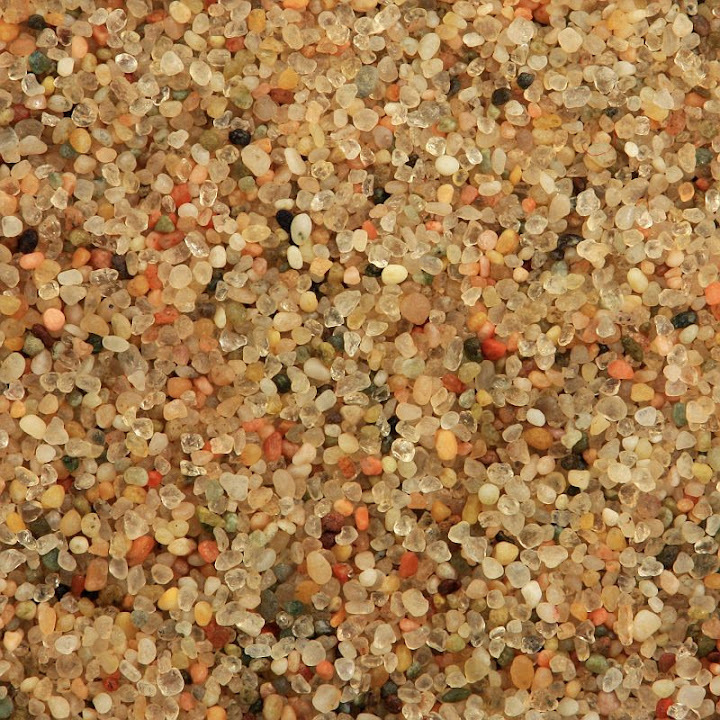 This sand sample is a dune sand from the Gobi Desert, Mongolia. Width of view 10 mm. Limestone is usually composed of calcareous remains of marine living forms. Sometimes they are large enough to be seen with a naked eye. 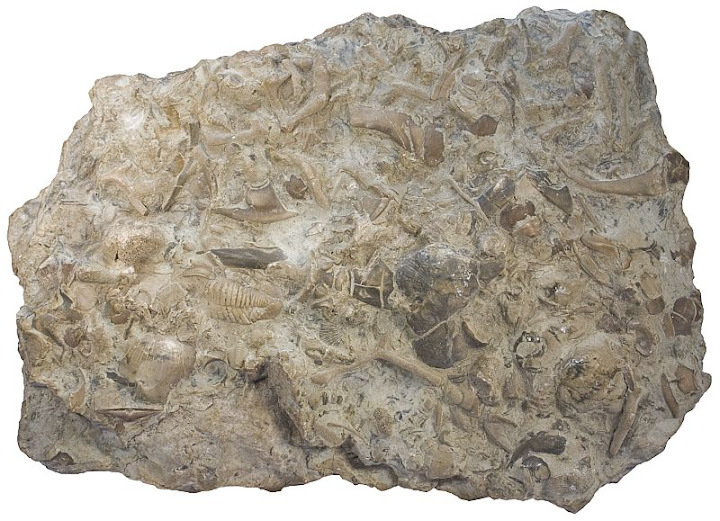 Here is a fossiliferous limestone from Estonia (Ordovician) with trilobite, brachiopod, bryozoan, etc. fossils. Width of sample 16 cm. Gypsum is an evaporite mineral. Evaporites are water-soluble chemical sediments that crystallize out of concentrated (high salinity) seawater in lagoons. Picture taken in Cyprus. Sandstone is a lithified sand. Reddish color is due to fine hematite (iron oxide) powder that covers quartz grains forming the majority of the sediment. An outcrop of Devonian sandstone in Estonia. Limestone is a lithified limy mud in most cases. An outcrop of Silurian limestone in Saaremaa, Estonia. Mudstone (alternative names are shale, claystone, and argillite) is a lithified mud. An outcrop in Scotland. Hammer for scale. Mudstones are the most common sedimentary rocks. Mudstones form in most cases as rapidly moving subaqueous avalanche of muddy water moves down the continental slope. Such a sediment flow is known as turbidity current. 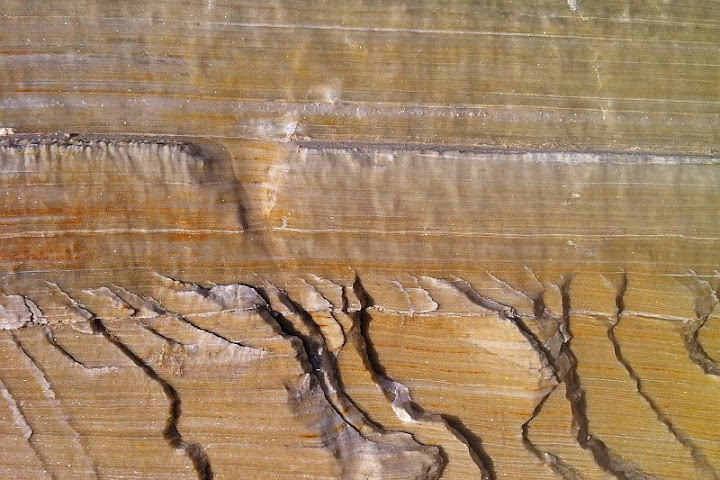 Turbidity sequence is typically composed of many alternating layers of siltstone (very fine sandstone) and mud. Silt settles faster than clay minerals do and therefore every current is composed of two distinct layers (there may be even more). Here is a picture of dark-colored mudstone and light-colored siltstone underneath it. These samples are from a turbidity current from Spain. The samples are from a single outcrop, but they were not next to each other there. The width of the samples is about 20 cm. An outcrop of turbidite in Morocco. 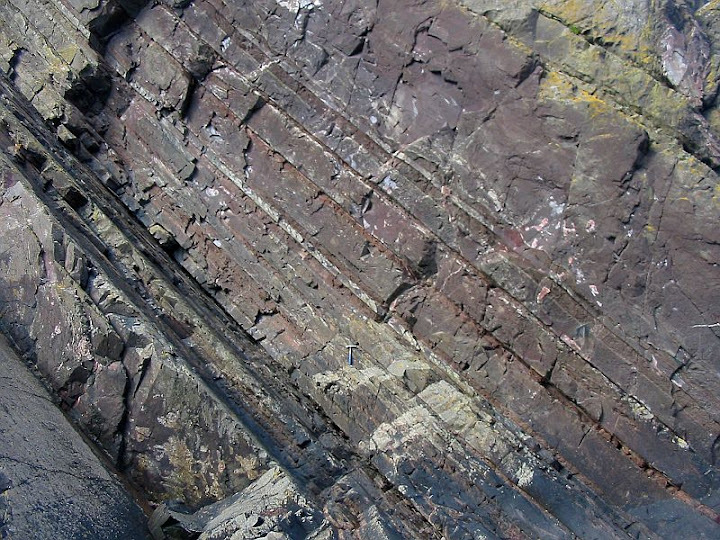 Sedimentary sequences like that were previously known as flysch. This term is nowadays rarely used because the explanation how flysch forms is clearly outdated now. It used to be an integral part of the geosynclinal theory which attempted to explain the mountain building process before we understood that much better explanation known as plate tectonics exists. 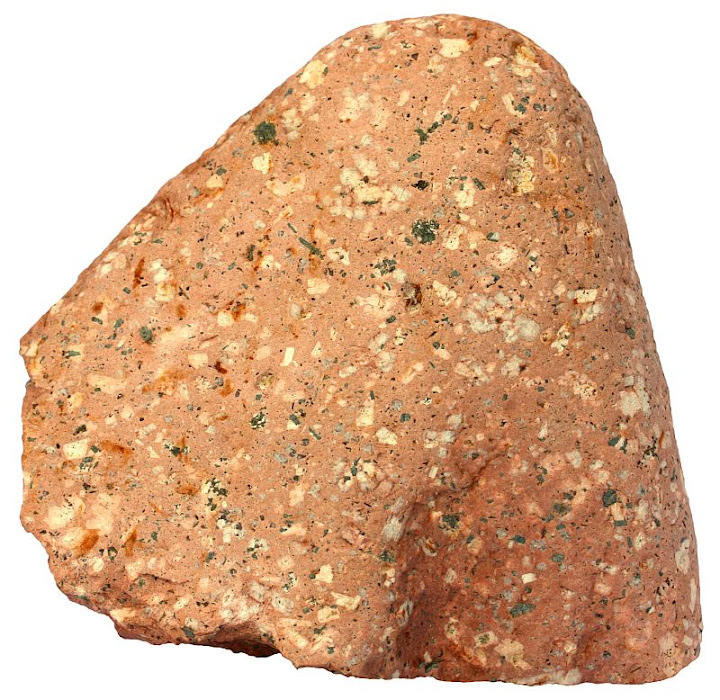 Igneous rocks are classified according to their silica content. Rocks that contain lots of silica are usually light-colored. Most important minerals are feldspars and quartz. These rocks are referred to as felsic rocks (feldspar + silica). Common felsic rocks are granite and rhyolite. Mafic rocks are low in silica but relatively high in magnesium and iron. They are dark-colored and named mafic rocks (magnesium + ferric). However, no matter whether they are felsic or mafic, these rocks always contain much more silicon than magnesium or iron. Important minerals in mafic rocks are pyroxene, plagioclase and sometimes also olivine or amphibole. There are also rocks intermediate in composition (diorite and andesite). 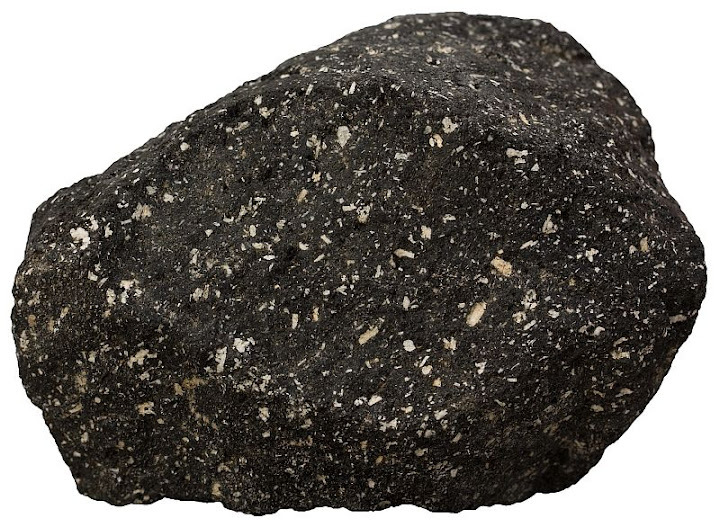 Igneous rocks are further classified as intrusive (plutonic) and extrusive (volcanic) rocks. Intrusive rocks are coarse- and extrusive rocks fine-grained. Granite, diorite, and gabbro are intrusive rocks. Rhyolite, andesite, and basalt are volcanic rocks. Felsic rocks are much more viscous and therefore relatively rarely break out to the surface. They usually solidify as intrusive rocks. Hence, granite is a very common rock type while rhyolite is not rare but nowhere as widespread as granite. It is different with mafic rocks. Basaltic magma is less viscous and relatively easily flows to the surface. 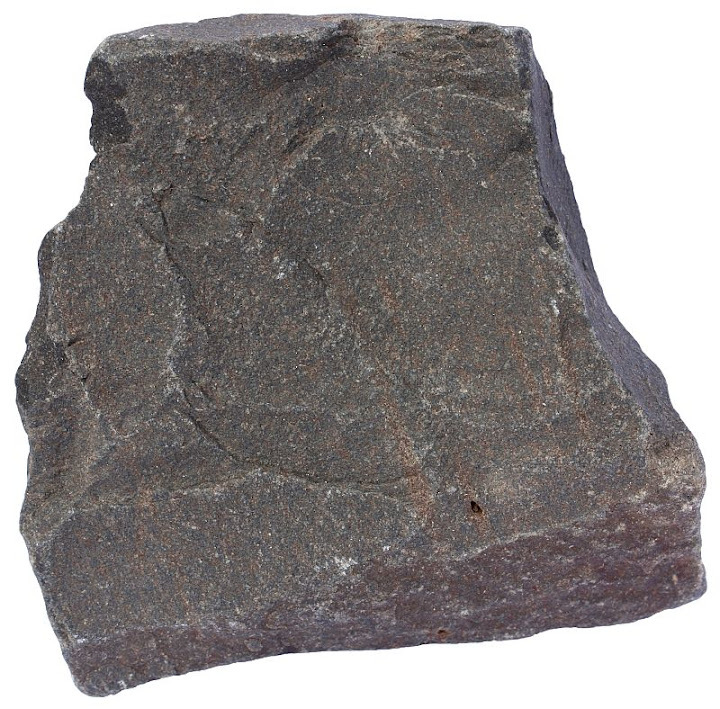 Basalt is very common rock type, especially in the upper part of the oceanic crust. Andesite is somewhere in the middle. It is pretty common rock type associated with subduction zone volcanism but not as widespread as basalt. By the way, the average composition of the continental crust is that of andesite. Hence, we believe that it gives us a hint how the continental crust formed. It is subduction zone volcanism that creates lava intermediate in composition that is less dense than basaltic rocks of the oceanic crust and is therefore not able to dive back into the mantle. So, the continental crust is not recycled by the conveyor belt of the oceanic crust and can only grow bigger and bigger as time goes by. Rhyolite is a volcanic equivalent of granite. The sample from Scotland is 8 cm in width. Gabbro is a mafic intrusive rock. The sample from Cyprus (from the Troodos ophiolite which represents former oceanic crust) is 7 cm in width. Basalt is a volcanic equivalent of gabbro. The sample from Northern Ireland is 8 cm in width. Andesite is a common volcanic rock which is intermediate in composition between mafic and felsic rocks. White mineral is plagioclase. The width of the sample from Santorini is 7 cm. This rock type was once sandstone, but it got buried so deep that quartz grains fused together to form a tough metamorphic rock known as quartzite. The sample is from Ireland. Marble is a metamorphosed limestone. It is composed of calcite. 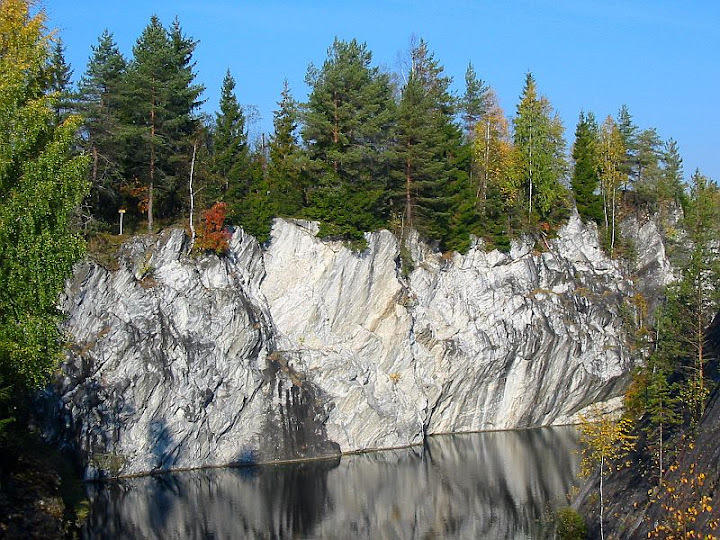 The outcrop is located in Karelia, Russia. 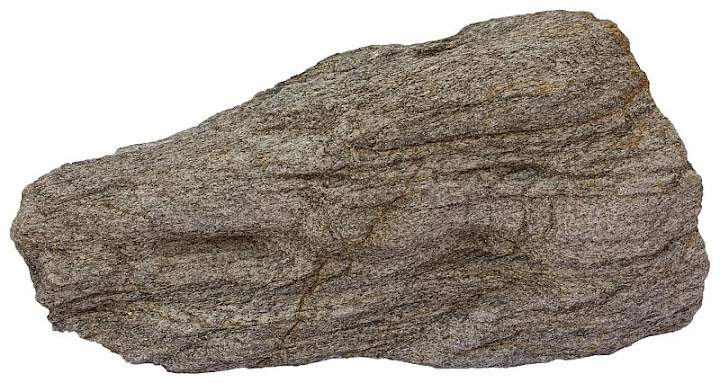 Schist is a strongly foliated metamorphic rock, most likely metamorphosed mudstone. Photo taken in Scotland. A hand sample of schist from Spain. Width of sample 9 cm. 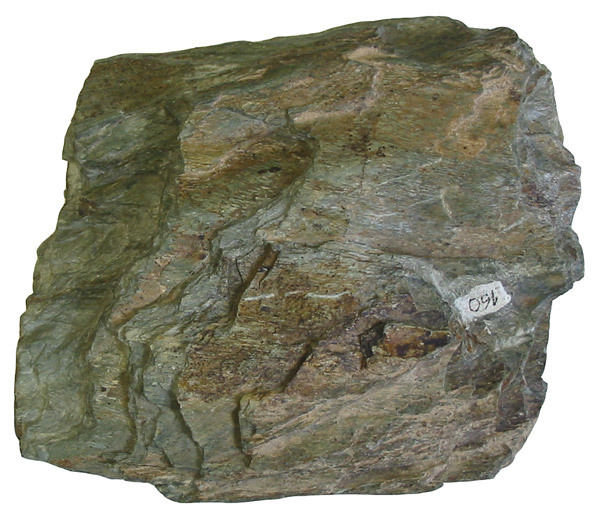 Chlorite schist is a metamorphosed mafic igneous rock that is rich in iron-bearing green sheet silicate mineral chlorite that gives slaty cleavage to the rock. Width of sample 13 cm. 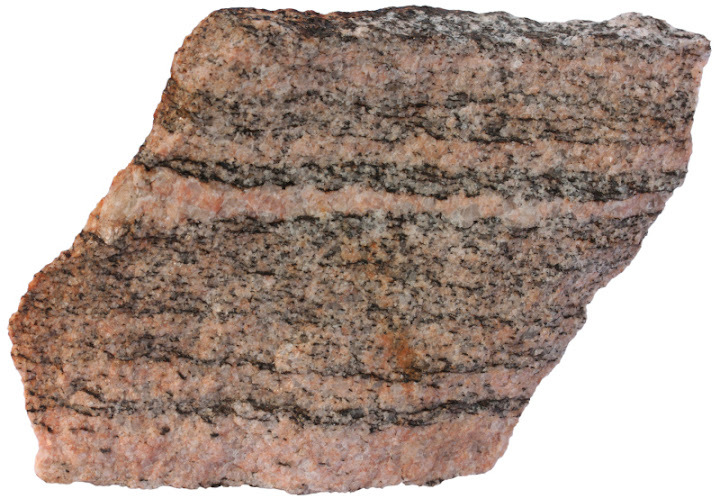 Gneiss is a very common metamorphic rock. Perhaps up to one fifth of the crust is composed of gneissic rocks. Karelia, Russia. This specimen has a composition of an ordinary granite: pink K-feldspar, gray quartz, and black biotite. Width of sample 11 cm. Marshall, Clare P. & Fairbridge, Rhodes W. (Eds.). Encyclopedia of Geochemistry (Encyclopedia of Earth Sciences Series) . Springer. This is a really fantastic primer and reference. I have learned quite a lot with this. Very interesting site. Continue your good work!